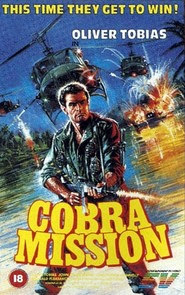 "In the John Wayne Action Packed Tradition Comes His Son Ethan Wayne..."
A group of disgruntled Vietnam vets, led by Mike (Wayne), Roger (Connelly) and James (Steiner) decide to go back to ‘Nam and find, then free, missing POW’s. Once “in country”, they get their guns and ammo from Father Lenoir (Pleasence), a priest willing to help the “five men against all”, to quote the Italian title of the film. Once loaded up with their supplies, it’s like the war never ended, as Viet Cong soldiers battle them every step of the way to protect their camps, seemingly unaware that there had been a ten-year break in the action. Naturally, the discovery of the POW’s leads to a government conspiracy that goes all the way to the top - and is the gruff Colonel Mortimer (Mitchell) involved? Will the men free the hostages and make it back home? And if they do, what then? 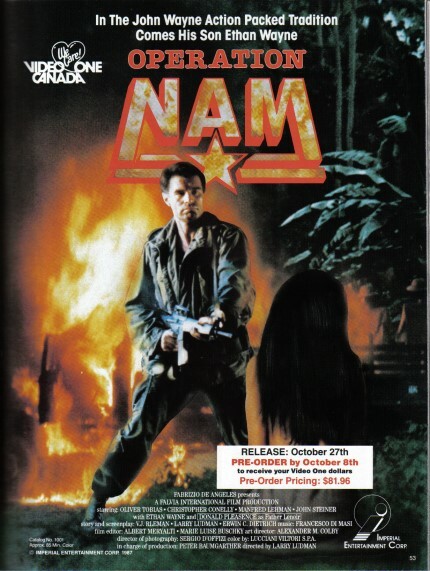 Operation Nam (or Cobra Mission) is a standard jungle action/drama you’ve seen before, but it does have its moments, as well as a cast familiar to anyone who loves Italian exploitation films. Besides familiar faces Steiner, Connelly, and Luciano Pigozzi (AKA Alan Collins), we also have cameos by Enzo G. Castellari and Ennio Girolami, and the whole affair was directed by Fabrizio De Angelis (the infamous “Larry Ludman”) without much panache. He’s a better producer than director, most people would agree. While the idea of moody, misfit Vietnam vets adjusting to a changed society is a fascinating idea for a film, these ideas are only touched upon in the first half. The second half is the mindless shooting, guard tower-falling, hut-exploding, grenade-throwing, bar-fighting action expected of this type of film. It would have been nice if the psychology and emotion of the men was explored more, but perhaps I’m asking too much of a churn-’em-out genre film such as this. In the plus column we have the fact that the film was made pre-political correctness, a character plays Pole Position on his Atari 2600, and one character insults another by calling him, and I quote, a “Suckfish”. Speaking of awesome dialogue, we also get an interesting glimpse into the future: right before one of the protagonists throws a grenade at a baddie, he says “You’ve got mail”. This comment, which precedes AOL by many years, must have served as an inspiration to that company. Not to mention inspiring the Tom Hanks/Meg Ryan crudfest, as that was a “bomb” as well! Ha! In the minus column we have the silly, Southern yokel-y dubbing for John Steiner's character, and some overall malaise. But John Wayne’s son is in it! Anybody? Anybody? 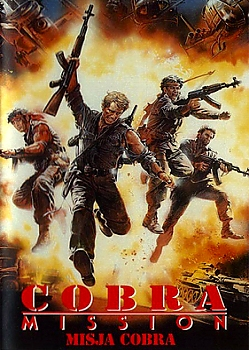 If you liked American Commandos (1985), you’ll also probably like this film, as it has a similar concept and execution, but this is not a prime example of Italian action. Still got this on video. Watched it again last year, and thought it was pretty good. Oliver Tobias (probably whacked out on drugs in real-life) played his part well. Like the 'Hanks/Ryan' analogy also! Glad you enjoyed it. Would be interested in a full review from you. Damn, I love Italian 'Namsploitation, I love the 80's, and I love the predictably disastrous results that so often stem from legacy acting. How have I not seen this yet. Thanks for bringing it to my attention. Your Welcome! Copies of 'Nam are fairly cheap on Amazon. It should be a big box VHS, which are always cool. I didn't even know John Wayne had a son, much less one who was involved in atrocities like this one. And I adore Donald Pleasence. There is absolutely nothing that man wouldn't do for a buck. Ethan Wayne is a national treasure and a close personal hero! This is definitely one on my review radar.. got a VHS and got a lovely off-air widescreen version too.. so expect a review sometime! Exploding huts! Total Exploding Huts! Looking forward to your review! I think I saw this way back when, but there were so many similar films at the time, they kind of blur but I love the Suckfish! Same Here! Love the Suckfish line! I've been meaning to get into more Italian 'Nam-sploitation, so this might be one to put on my radar-- it looks like fun. Operation Nam was silly 80s fun! I got ém both but fears to revisit this one since it was quite boring the first time i saw it a while back. Specially after all those years of adoring it´s cover. We will definitely look for a copy of the sequel. Hope to see it on your site one day!